Many of our customers don’t know that our first passion was turf grass. Willow Valley Golf Course is the brainchild of two ambitious sod farmers who wanted a course of their own to showcase their turf grass efforts. Greenhorizons Sod Farms started in 1975 and all that turf-farming experience has culminated in the design of this beautiful track. 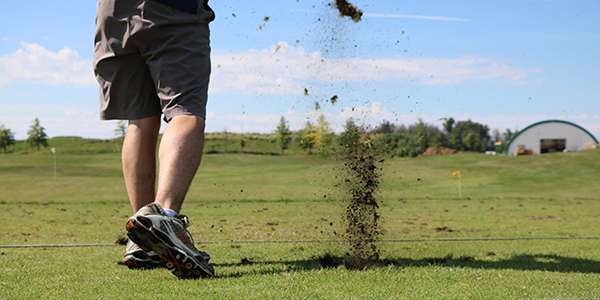 Being sod farmers, we feel a little heart-ache whenever someone takes a swing and launches a big divot. We know that divots in golf are inevitable, but our sod farming roots still trigger a bit of a gut reaction. About half an acre of turf is removed from an 18-hole course during an average year of golf, according to Dr. Aaron Patton of Purdue University. That’s over 2000 rolls of sod, per year, in divots! So what can you do to help us rest a little easier? It’s simple really: replace your divots! A recent article in Turf & Rec magazine, a Canadian publication for sod-advocates, detailed the importance of replacing divots on the golf course. They reference a study performed by a golf superintendent. He compared replacing divots versus simply filling in the cavities with a mixture of sand and seed. After two weeks, it was evident that the replaced divots were beginning to root. However, the sand mixture hadn’t even begun to germinate yet. Even if the piece of grass that you put back ends up dying, the soil conditions will be improved. This will allow the divot to fill in faster. The replaced divot might provide a better lie to the next golfer that ends up landing a ball there. Many golf courses provide divot repair mix on their carts or sometimes on the course. For instance, they can be kept at tee boxes. While divot repair mix isn’t quite as effective as replacing your divot, it’s still better than doing nothing. If it’s available, spread some mix into the divot, being careful not to overfill. One of the most common mistakes when repairing divots with sand mixtures is leaving a mound in the divot. This will create an obstacle and can cause issues for golfers playing behind you. It's better to make the repair level with the soil base. 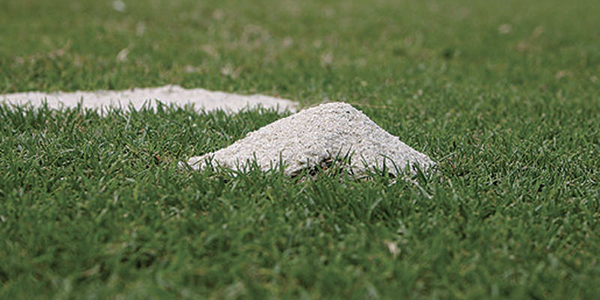 Be courteous and repair divots to the best of your ability while keeping up with the pace of play. Everyone in the game of golf should be aware of replacing divots. Some people take more divots, and some take less. It doesn’t have anything to do with your handicap. No matter how many divots you take in a round, try to replace them all. The course superintendent will surely thank you later.